I mentioned in my last post that my baby boy turned one. This past year has been truly incredible and I am thankful for every moment, even the first six months where he did not sleep through the night. 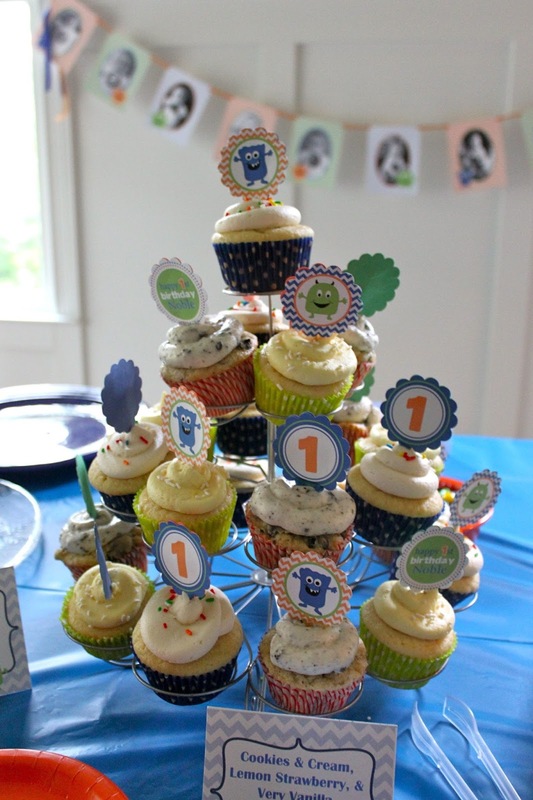 To celebrate my little guy we had a Monster themed birthday party. We gave him his own little cake which he tore into and fun was had by all. I made three types of cupcakes for the party, Lemon with Lemon Frosting, Vanilla with Vanilla Frosting, and Vanilla Oreo with Cookies and Cream Frosting. I ate a Lemon Cupcake which is one of my favorite, but I can tell you that the Oreo went first and people raved about them. In a medium bowl combine the flour, baking soda, baking powder, and salt. In a separate mixing bowl, cream the butter and sugar. Beat in the egg and egg white, one at a time. Add the vanilla; mix well. Add the flour mixture to creamed mixture alternately with sour cream (batter will be thick), gently stir in Oreos. Fill greased or paper-lined muffin cups with 1/4 cup of batter. Bake at 350 degrees F for 20-25 minutes or until a toothpick inserted near the center comes out clean. Beat butter and cream cheese with until fluffy, 2 to 3 minutes. Slowly add sugar, 1/2 cup at a time. Add salt and vanilla; mix until smooth. Place Oreo cookies in a fine strainer to remove any small particles. Gently stir Oreos into the frosting, careful to not over stir. Frost cupcakes as desired. Store any remaining frosting in the fridge.